The following map shows the main dialect divisions in present-day Ireland. The East Coast region is where English was first introduced into the country in the late twelfth century and stretches from Waterford up to the area beyond Dublin. In the south-east corner of the country the archaic dialect of Forth and Bargy (read: /bargi/) survived until the beginning of the nineteenth century. The north of Ireland is characterised by a cluster of Ulster-Scots varieties along the coastal crescent with the English-based Mid-Ulster English in the centre of the province. The large area of the South-West and West is fairly uniform. This is the area where Irish was spoken longest and shows features (above all in syntax) which resulted from the language-shift which largely took place between the seventeenth and nineteenth centuries. Irish is still spoken in small pockets along the western seaboard: in Kerry (tip of Dingle peninsula), in Galway (west of Galway city in Connemara) and in Donegal (along the north-west coast). The English of native speakers of Irish can be termed Contact Irish English. Because of the historical stability of the county boundaries in Ireland, speakers identify with their home county and (self)-reference is frequently by county name, e.g. ‘I’m a Kerry man myself.’ or ‘Speaking as someone from Mayo,...’, ‘So she was going with this guy from Donegal...’ (quotes from author’s recordings). Linguistic comments made by the author’s informants over the years have very often been based on county, e.g. ‘Yeah, he had this sing-song Cork accent, you know the way they go up and down all the time, the people in Cork.’, ‘I used get made fun of in school for my Limerick accent.’, ‘Now the accent down here in Waterford is different from other parts of the country.’ Sometimes references are made to larger regions in Ireland, e.g. when speakers complain about the flat Midlands accent or label the Northern Ireland accent as harsh or grating. Global references to accents in the West of Ireland are less common, though the region does figure in the popular imagination as an area distinct from the more urbanised east coast. The South of Ireland is often synonymous with the Republic of Ireland (as distinct from Northern Ireland) and so references to the geographical south, i.e. the region south of a line from Dublin to Galway are rare. In the following features are listed which are typical of three main areas of the south of Ireland (Ulster in the north is a separate case, see section on English in Ulster on the tree to the left). The east coast is delimited by a number of features not found elsewhere. 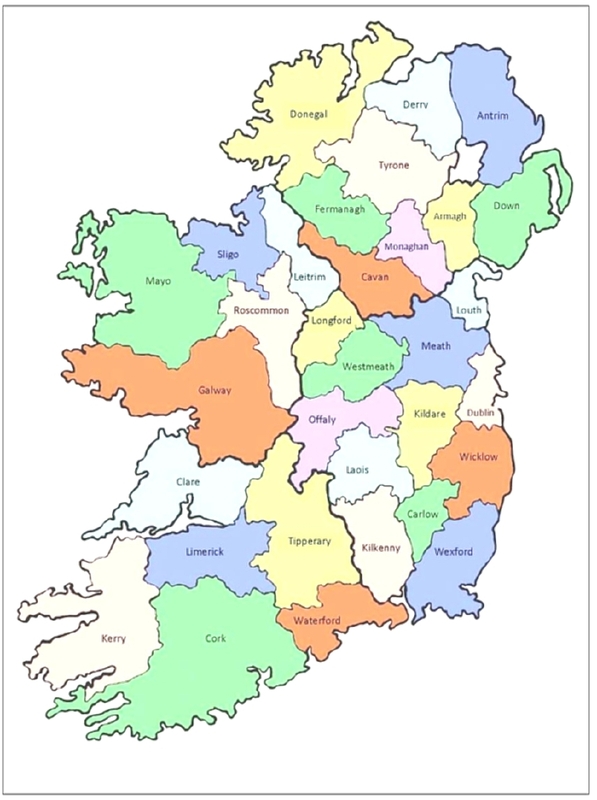 The south / south-west is a large area which has been influenced more than any other by the Irish language. The transition features towards the north show the gradual adoption of true northern features by speakers in the border areas from Co Sligo across to Co Louth. Some northern features, such as the high central u reach down along the east coast well below the present-day border between the Republic of Ireland and Northern Ireland.